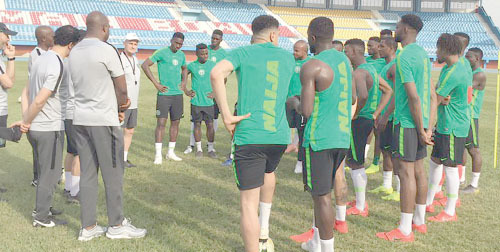 Twenty-three players for the dead rubber AFCON 2019 qualifying tie against Seychelles and the international friendly against Pharaoh of Egypt have arrived the Super Eagles camp in Asaba, Delta State for the ties. The players, according to the national team twitter handle @Super Eagles are in and were part of yesterday’s training at the Stephen Keshi Stadium, Asaba. The three-time African champions confront Seychelles in a largely ceremonial session on Friday, 22nd March, starting from 4pm and then tackle the Pharaohs of Egypt at the same venue in an international friendly four days later. The players in camp are: Francis Uzoho, Daniel Akpeyi, Ikechukwu Ezenwa, Kenneth Omeruo, Abdullahi Shehu, Chidozie Awaziem, Leon Balogun, William Troost Ekong, Jamilu Collins, Effiong Ndifreke and Valentine Ozornwafor. Others are: Semi Ajayi, Wilfried Ndidi, Etebo Ogenekaro, John Ogu, Moses Simon, Ahmed Musa, Victor Osimhen, Moses Simon, Henry Onyekuru, Odion Ighalo, Alex Iwobi and Paul Onuachu.